As far as introductions to 1980s cinema goes, you can’t go much worse than the truly sensational Star Wars: Episode V – The Empire Strikes Back. A true masterpiece in storytelling (“I am your father”), visual effects (the opening battle on Hoth alone serves as one of the greatest sci-fi action scenes of all time) and world building (remember, it was Empire that introduced us to Boba Fett, Lando and Yoda), it has passed the test of time with flying colours, and is not only the best Star Wars ever made, or even one of the best sequels ever made, but one of the best films ever made. But although it has a timelessness about it in its sheer cinematic quality, Empire is also very obviously a product (and influencer) of its era: notice the beautiful neon cinematography of the climactic duel between Luke and Vader; the grubby, life-like “worn-in” aesthetic later popularised by Blade Runner and Aliens; and the sheer excitement and enthusiasm at the chance to explore space (we were introduced to Dagobah, Hoth and Cloud City in Empire) just as the space shuttle was promising to do outside the movie theatre. It truly is one of the greatest films of that eclectic decade. Any introduction to 80s cinema would be incomplete without citing John Hughes’ coming-of-age masterpiece, The Breakfast Club. Serving as one of the greatest high school movies of all time, it’s set over the course of a day in Saturday detention, in which all of the school’s stereotypes attend and ultimately break down their respective cliché’s to realise that they’re not all unreachable. Simple in its plot, The Breakfast Club is a film built on fast-paced dialogue and humour, with Bender – the angsty antagonist – often dominating and commanding narrative direction, until his realisation that he can ‘get the girl’ by just showing his human side. It’s the final scene, where they tell their supervisor, Mr. Vernon, that “you see us how you want to see us… but what we found is that each one of us is a brain, an athlete, a basket case, and a princess” and Bender raising his fist in triumph to Simple Mind’s ‘Don’t You (Forget About Me)’ that makes this movie such a great introduction to 80s cinema, and also to the architect of the teen movie genre, John Hughes. Often dubbed as his best work, The Breakfast Club remains timeless in its encapsulation of the strain of category controlled high school life. Considering that we’ve past the 2015 future predicted in the film’s sequel, you’d be forgiven for thinking Back to the Future is now little more than a dated 1980s trilogy past its sell-by date. However, this timey-wimey classic is still the absolute gem that it was when it released back in 1985. Featuring Michael J. Fox as rebellious teenager Marty McFly and Christopher Lloyd as eccentric scientist Dr. Emmett Brown, it’s the relationship between these unlikely friends that has helped Back to the Future stand the test of time. After a time travel mishap, Marty is thrown back in time to 1955 and accidentally throws his parent’s supposedly flourishing relationship into question. Director Robert Zemeckis cleverly uses a sci-fi premise to craft a film that is really a coming-of-age comedy at its core. 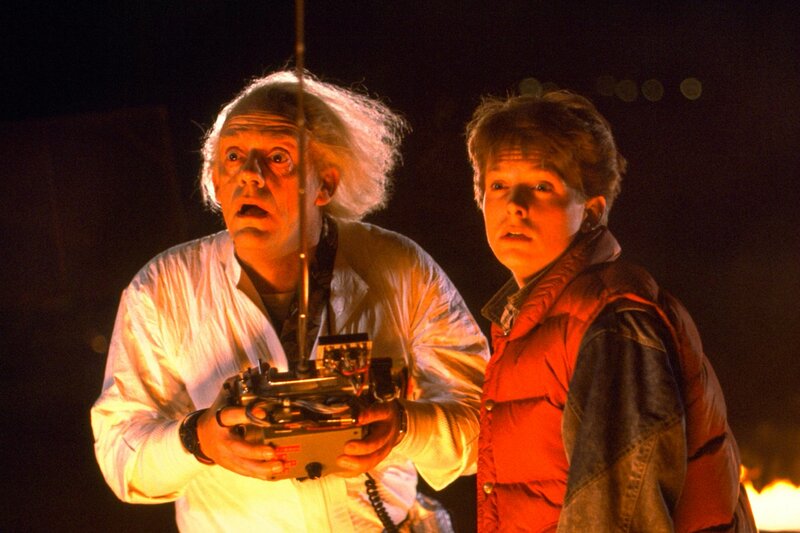 It’s a shame that we haven’t seen Doc and Marty since the original trilogy released, but it means that the series still stands a symbol of the 1980s. After the success of Ridley Scott’s Alien, it came as no surprise when Twentieth Century Fox announced its intention to produce a sequel. More surprising was the direction James Cameron chose to take the franchise, making Aliens a classic example of science-fiction cinema and a great introduction to a decade bursting with iconic films. Whereas Scott relied on horror, Cameron presents an outstanding blend of science-fiction and bombastic action. Aliens is a thriller bursting with cursing marines, deadly xenomorphs and one of the best action heroines in cinematic history, Ellen Ripley. Aliens earned Sigourney Weaver both her iconic status and an Academy Award nomination, but the lasting effect Ripley has had on the representation of women in cinema can still be felt today; from Linda Hamilton’s Sarah Connor, to Jennifer Lawrence’s Katniss Everdeen, and Daisy Ridley’s Rey. In one film, Cameron proved that a sequel didn’t have to be a copy, and that a woman could be more than just a damsel. Labyrinth, the classic eighties David Bowie film directed by Jim Henson and executive-produced by George Lucas, is one of the most iconic films of the decade. Based on 15-year-old Sarah (Jennifer Connelly) and her journey to rescue her brother who’s at the other end of a giant maze, she wished him away to Jareth, the Goblin King (David Bowie) and very much regretted her decision. Despite receiving a mixed critical reception when initially released, grossing $12.9 million in its US run in theatres and considered a box office disappointment, it now has somewhat of a cult following. Aside from Connelly and Bowie, most of the cast are puppets. The baby that was kidnapped replaced the initial actor baby, and was the child of the costume designer – the actor was scared of the puppets, but because the child had seen them before they weren’t. Influences of the film include The Wizard of Oz where a modern child is lured into a wild land, and the plot is very similar to Outside Over There, where a child’s baby sister is stolen by goblins. Helena Bonham Carter was auditioned for the role of Sarah, but they decided on an American actress eventually. What a different cast it could have been! Dirty Dancing is one of the most well-known cheesy rom-coms of the 80s, if not ever. The low budget, danced centred film quickly made a storm at the box-office and the hit song ‘(I’ve Had) the Time of My Life’ won a Grammy for best duet, alongside both a Golden Globe and Academy Award for Best Original Song. If you haven’t seen the movie, which you should, then you would have probably heard the song. The plot is a pretty simple, cute romance with a dancing twist. Baby (Jennifer Grey), sporting a very 80s perm and determined to go into the Peace Corps, has been dragged on her family holiday to an expensive dancing camp in America. While her sister jumps at the opportunity to show off her awful singing prowess, Baby joins in with less enthusiasm. Meanwhile, a struggling dance troop hired by the camp finds itself in trouble when the lead woman drops out. Baby attempts to be helpful by trying to learn the dance routine and take the lead so the troop can still be paid for their summer of work. After some flirty dancing, a little romance, a protective dad, and a cute speech, the movie ends with it’s famous song and Baby impressing her family with her new-found dancing ability. Tim Burton’s Beetlejuice is a bizarre tightrope walk between creepy and fun, and definitely worth including on a list of the best offerings from the ‘80s. After a car accident cuts short their time in the land of the living, Alec Baldwin and Geena Davis are forced to inhabit their house as ghosts for the next 50 years, and their attempts to scare off the obnoxious, bohemian new inhabitants fall flat. They enlist the help of Betelgeuse (pronounced Beetlejuice), a veteran poltergeist, but get far more than they bargained for when an unhinged, lascivious, mouldering spirit begins to wreak havoc. A high point of Tim Burton’s early career, Winona Ryder’s breakthrough role as vulnerable yet savvy goth girl Lydia Deetz is truly convincing and part of what gives the film so much heart, and Michael Keaton is equal parts cartoonish and scary as Beetlejuice. The dinner party possession scene is one of the most memorable moments and perfectly encapsulates the ‘80s trend for trailblazing and mixing genres – Beetlejuice ticks all the boxes as an offbeat fairytale about embracing weirdness that Burton throws inside a horror film and drives off a cliff. Great stuff. I am a third-year computer scientist. As a lover of fantasy and massive bookworm, when not behind a screen I can be found with my nose in a YA novel or attempting to write something. I'm a tragic cook but a pretty keen coder. Can be found on Twitter @hannah_dadd . Graduate in Film and an MA student in Creative Writing. Avid reader of YA novels. Cosplayer. Storyteller. Netflixer. Browncoat. Bucketlist includes flying an X-Wing, completing a novel, and working with Joss Whedon and Michelle Fairley.